Orchha is reportedly the only place in the country where Lord Ram is worshipped in his royal aspect and not as an avtar of Vishnu. 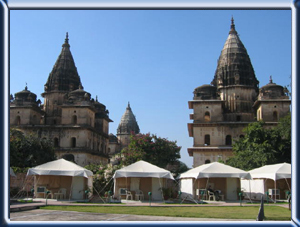 It is said that Lord Ram resides in Ayodhya by day and sleeps in Orchha at night. Hence the Ram Raja Temple remains closed throughout the day : the heavy silver doors of the sanctum are flung open only at 7 p.m. when the evening aarti is performed. It's a moving ceremony laced with a certain amount of pomp and fanfare. Ram's wedding is enacted each year in mid December. Orchha itself resembles a bedecked bride as the baraat - comprising gorgeously decorated chariots, caparisoned elephants, and horses - wends its way down the narrow streets. Later, the town celebrates the royal nuptials over a banquet hosted by the temple trust. Pick up from Agra (from Hotel) and proceed to Gwalior. Overnight at `The Orchha Resort'. After breakfast sightseeing of Orchha and proceed to Khajuraho. Check In at `Taj Chandela'. After Breakfast Proceed to Orchha. Lunch/Snacks at `The Orchha Resort'. Drop at desired spot in Agra.